I recently had the pleasure of seeing an exciting, visually stimulating and fun museum exhibit featuring the work of Dane Goodman & Keith Puccinelli. The exhibit entitled “tug” is currently at the Westmont Ridley-Tree Museum of Art in Santa Barbara through October 17, where both artists live. I was fortunate to be able to view the exhibit with this artistic duo before it opened on September 2. Dane and Keith started their cooperative partnership about six years ago. 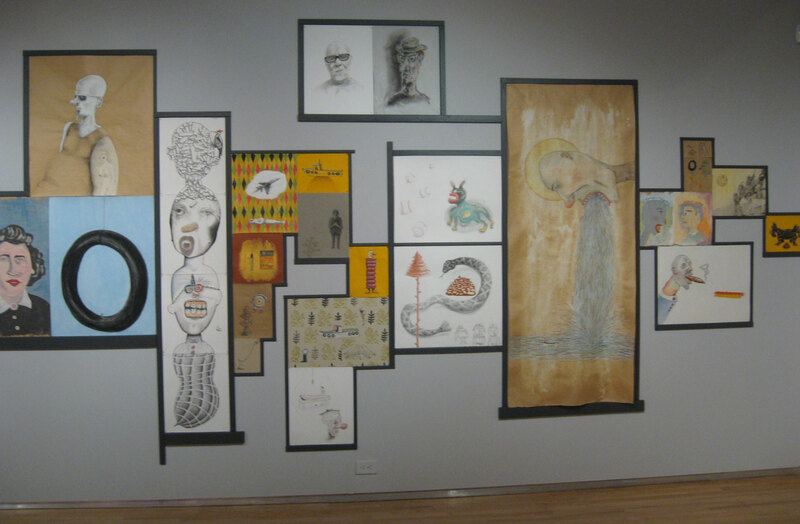 Both artists’ practice included many personal images (clowns, snowmen, warplanes, bombs, trees, etc.). They began using a form of printmaking called trace monotype, a drawing-based print. One artist drew an image responding to an idea, current events or personal experience, and then the second artist drew an image on the same paper. The dialogue between the artists is often humorous but also can deliver some stinging punches. Jane Deering exhibited the full set of Goodman and Puccinelli’s trace monotypes in the exhibit “eating fresh peaches and tomatoes talking about death drawing together” in her gallery in 2013. The exhibit was inspiring, very well attended and much talked about in Santa Barbara. 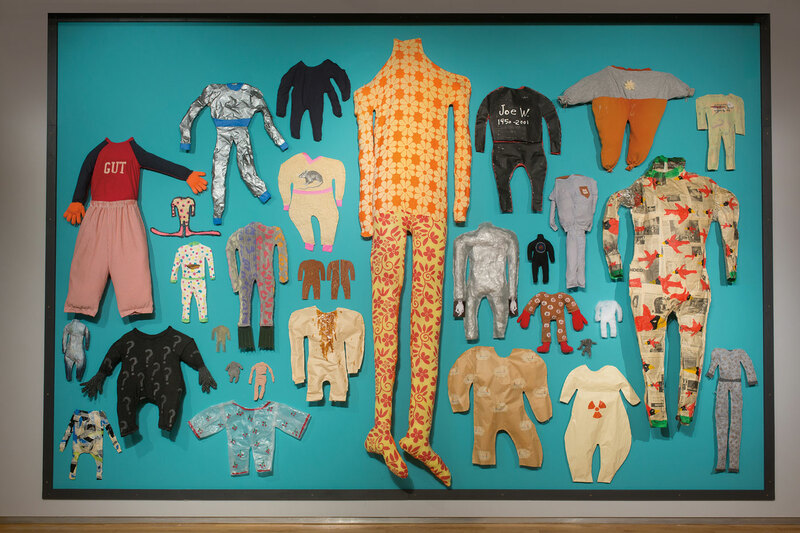 Due to the astuteness of the gallerist and the interest from the Westmont Museum’s director and professor of art history, Judy Larson, the 110 one-of-a kind prints were purchased by the museum. These innovative and playful prints are being shown at the museum in addition to many drawings, paintings and sculptures that have been produced in the last two years. The centerpiece of the exhibit is “The Boat,” a glowing, three-dimensional, full-scale boat that is provocative and optimistic. Both artists possess excellent senses of humor. Goodman’s imagery and content was shaped by exposure to the Hairy Who and Chicago Imagist artists while growing up and studying in Illinois. 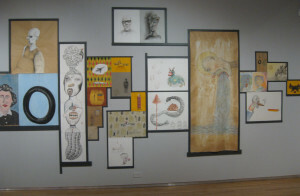 While attending graduate school at Sacramento State University (my alma mater), he was also exposed to Bay Area Figuration and the Funk and Assemblage scenes in northern California as well as influences studying with “Hairy Who” artist Jim Nutt, conceptualist Stephen Kaltenbach and painter Oliver Jackson. Puccinelli was also exposed to similar influences while attending San Jose State University. In addition, his ongoing preoccupation with Italian Pulcinella and comedia dell’arte imagery added to his toolbox of compelling images. His studio artist practice ran parallel with his very successful business as a top graphic designer and illustrator. I hope that the playfulness and camaraderie of Goodman & Puccinelli’s collaborative work will continue and that there will be many more opportunities to see and experience the “tug” of insight and provocative vision from these two very talented artists.